Whether an oncology navigation program is just starting out or has already become a well-oiled machine, there are usually a few—or perhaps, quite a few—ways that a navigation program can potentially be improved, according to Lillie D. Shockney, RN, BS, MAS, ONN-CG, Co-Founder and Program Director of the Academy of Oncology Nurse & Patient Navigators (AONN+). Left to right: Katherine Sharpe, MTS; Sloan Maes, MSN, RN; and Crystal Dugger, RN, BSN, MBA. 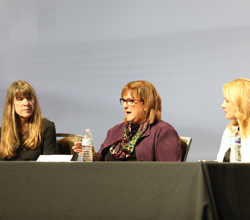 At the AONN+ 9th Annual Navigation & Survivorship Conference, Ms Shockney moderated a session focused on “supercharging” oncology navigation programs. The panelists, Crystal Dugger, RN, BSN, MBA, Assistant Vice President of Clinical Operations at Sarah Cannon; Katherine Sharpe, MTS, Senior Vice President of Patient and Caregiver Support for the American Cancer Society; and Sloan Maes, MSN, RN, Oncology Service Line Director at Memorial Hospital - University of Colorado Health, shared insight into breaking down the common barriers to developing, implementing, and sustaining a successful navigation program, and focused largely on the importance of demonstrating its value to cancer center administrators. Often, institutions don’t know where or how to begin a navigation program. According to Ms Shockney, gathering baseline information and conducting a needs assessment should come before any attempt to make changes. “I always say, ‘You cannot manage what you do not measure,’” she said. “But if you feel frustrated or you feel like you’re out there on an island, you are,” she added, noting the importance of utilizing resources that have already been developed and tested, such as the AONN+ Standardized Evidence-Based Oncology Navigation Metrics, or the robust metrics program designed by Sarah Cannon. Ms Maes added that navigation programs should capture metrics that are relevant to their own institution and important to their stakeholders; for instance, a community-based program would prioritize different metrics than a larger program like Sarah Cannon. One of the primary considerations in launching a navigation program is funding. “A lot of navigators are still funded through grants or philanthropy, and that’s really not sustainable,” said Ms Shockney. Demonstrating return on investment is crucial to securing the funding necessary to build and sustain a navigation program. According to Ms Sharpe, the use of standardized metrics across navigation programs will continue to contribute to the evidence base around navigation and demonstrate the value of that investment. “Shoot for the stars,” she added. At a meeting with administrators, ask for more navigators than you’ll realistically receive, and reach a compromise. Find a physician champion or champions who believe in navigation and can help in obtaining buy-in from executive leadership, and bring them to join in on the conversation. Then, pick a few metrics—3, not 30—and go demonstrate their impact, she advised. Take every opportunity to tout the efforts of the navigation team, because that can have a major impact on funding decisions, Ms Sharpe added. Save thank you cards, patient satisfaction comments, and notes of gratitude from patients in a portfolio. “They’re incredibly important,” she said. According to Ms Dugger, the absence of metrics makes it incredibly difficult for administrators to really understand the role of the navigator. Unfortunately, attaining the necessary administrative support to build and foster a navigation program can sometimes be thwarted by “oncopolitics,” a phenomenon that essentially consists of competitive interests or power struggles in oncology care.